I am a Mega Quilter. Well, I own one anyway. It's all part of my vision for The Molly Patch. Now that the machine is in my garage, I need to clean up the basement space and create a studio. That means that Curly's home office is done and all "workshop" projects must be completed in the garage. It also means that I am going to have to dig deep within myself and find some organization and structure. I know it's in there. After all, I was a scheduler as a career. Check my website (and here of course) for info on when I'll be ready to take your quilts and turn them into heirlooms. I started a second blog. Say what? It's called Recip-Ease, and will be for recipes. Add it to your bloglines, because it won't be a daily affair. I also hope to get a couple of contributers (hint hint, Emily) so I won't be all alone. Last night, Curly and I watched the ladies battle it out on American Idol. This week, the question the contestants answered was "What is one thing America might be surprised to know about you." I had a laugh when Brooke White answered that she went to beauty school and liked to cut hair. So does the real life Brooke White that I know! Flower did not come over last night because Curly has had the bug that's been going around. We do get her for the whole weekend, though, so it's all good. I'm not sure what we're going to do on Saturday. Curly has a meeting all day, so we may drop him off and then go meet baby Marianne. But, then again, since we have been sick, Marianne's parents may tell us to stay away. That would be fine, too. My computer was hijacked for the past few days. Luckily, the hijacker turned her tiny back for a few moments and I stole it back. Mini-me loves to play games on the computer. So, if I want several hours of an occupied 4 year-old, I open the Disney home page, select a preschool game, and let her go. She likes to start with some Bunny Town action. She creates her bunny persona (which is purple and wears a tutu, a crown, and funny glasses "just like mommy"), then plays a game. Each game helps her earn carrots, which can then be redeemed in the Carrot Shop for things to put in her bunny house. She has to match letters, count scoops of ice cream, listen to directions, and do other fun learning games. From there, she then goes and plays a game with Mickey Mouse and his friends. Her favorite is the Musical Maze, which takes Pluto through a maze to find different musical instruments. She likes to do this all by herself, and usually while wearing some sort of costume. Patch just clued in today that she was doing something awesome, and got a little jealous. But, he was able to play with the keyboard, compete with microphone, so even he was busy for awhile without hanging on me. My kids are smart. I probably am just saying that because I'm the mommy, but whatever. We have stayed away from the YMCA for several days now. Patch's nose has been running like a champ and Mini-me has had some attitude problems. She got kicked out of Primary on Sunday because she wouldn't sit still and listen during the lesson and she kept turning the lights on and off. For those who think that might be a bit harsh for a class of 4 and 5 year-olds, the lesson is only about 5 minutes. Any kid that age can sit for 5 minutes. Then, on Monday, she was not quiet during circle time, even though Miss Kelly (whose first name is Kelly and just got married and now has the last name of Kelly) told her she needed to be quiet. She did not get her sticker. I picked up a very sad Mini-me from school. Hopefully tomorrow will be better. Hopefully Patch's nose will stop running. Hopefully I can log in some time on a treadmill. Heaven knows I need it. Have you tried the nickname generator? My nickname is "Little Bo Peep." Very clever, Sawyer. 4. Post the next five sentences. "THERMOMETER, MEAT: For testing the internal temperature of cooked meats. These have a thin, 4- to 5-inch long stem that is inserted into the roast, and a dial on the end that indicates the temperature. There are two models: one is inserted into the meat before it goes into the oven; the other, called an instant-read or rapid-response thermometer, is inserted near the end of the cooking timel it is never left in the meat as it cooks. Always insert deep into the thickest part of the meat, without thouching a bone, which can result in an incorrect reading. WOODEN SPOONS: The most essential tool for mixing everything in the kitchen -- from sauces to soups and salads." Here are my tags: Rebeccah, Emily, Sarah, Michelle, and Angie. It's days like today where I wonder if it would be such a bad thing to give my 4 year-old some Diet Coke in the afternoon. Not a whole lot, just enough to perk her up a bit. We were off school today due to the threat of bad weather. It was bad for a bit, but not for long. Mainly, it was disappointing. We expected bad snow and ice and pandemonium, but what we got were some flurries, a mist, and then grey. Patch had his 18 month well-child visit today and was pronounced to be in the 25th percentile for weight. Considering Mini-me was close to the 10th at this point, we think he is quite the chunker. Mini-me wanted an examination as well, and started to produce various "boo-boo's" for the nurse to inspect. When Patch was all ready to go, Mini-me cried: "But wait! I am very sick!" Disappointment reigned again. We are now home, Curly has a show tonight, and the kids will be in bed early. I plan to curl up with my stitching and watch a movie. And then go to bed early. If I had my way, I would keep all the guys and get rid of 4 girls tonight. For the most part, I was disappointed in most of the gals. I had very high hopes for Brooke White, but she was doing some weird thing with her hair that was distracting. I am chalking most of last night up to overconfidence, so hopefully next week they will just sing their little hearts out and do much better. Last night, Flower and Curly had the Daddy-Daughter Dance at church. Somehow, people have gotten the idea that the O'Kigins are dancers. Nothing could be further from the truth, but that doesn't stop us from being asked to teach the Virginia Reel to teenagers at Youth Conference (why that dance? We grew up in Virginia. Duh). Curly was asked to teach some ballroom to the 8/9 year old girls and their dads. He settled finally on the Cha-cha-cha, which we learned together at a YMCA class a few years ago. In case you were wondering, no, we were not good. Anyway, I digress. He and Flower practiced for a few songs last night before they left, which made Mini-me a little jealous. Curly told her he would dance with her later as I took her and Patch up to get pjs on. Mini-me hurried as fast as she could, insisted on wearing her "Princess Dress" pjs, put them on all by herself, and ran downstairs calling out: "Guys, guys! I'm ready to dance!" It was the saddest moment ever when she realized they had left without her. She cried and cried, and as she brushed her teeth, Mini-me told me she was: "Sick and tired of it." When Curly and Flower returned from their amazingly fun evening, I told them the story and started to cry. I felt so sad for poor Mini-me, who had her heart set on a dance with her Daddy. She's had a better day today, but mainly because she spent several hours with her favorite girl from church, Miss Danielle. 1. David Archuleta. Could he get any cuter? Plus, he can really sing and turn on the charm. Love him. 2. Jason Castro. Yeah, this one surprised me, too. I am not a fan of dreads, because they smell and have bugs, but he has such an easy, breazy style that I think is great. Plus, he played his own guitar last night (the only one to play his own instrument), even though he's a drummer. 3. Luke Menard. Simon said he was "forgettable," but I obviously remembered him. I didn't think he was pitchy (like Randy said), but I do think he looks like McDreamy. He sites James Taylor as a musical influence. I can see that. I made a delicious dinner tonight of Chicken Piccata and some spinach. Other than being a tad too lemony, it was fabulous. My advice when making this is when it says to put the cooked chicken into the oven on a pan lined with parchment paper, follow the recipe and don't use waxed paper. For years I have searched for a movie I could love as much as Pride and Prejudice. Our babysitter told me about North and South a few months ago. At first, I thought it was a Civil War movie, but she quickly corrected me and said it was about England and that my heart would be: "ripped out. Ripped. Out." I put it on my Netflix queue, and both disks arrived this week. Oh my. Could there be another man so misunderstood as Mr. Thornton? Could there be a heroine quite as headstrong as Margaret? They put Mr. Darcy and Lizzie to SHAME people! I stayed up until 12:30 watching all 4 installments. I tried to stitch, but I would find myself staring at the screen with my hands motionless. Wow. That's about all I can say. Wow. This is one that I definitely want to have in my DVD collection, and it's a book I can't wait to read. Rent it this weekend, you will not be disappointed. Last night, Flower wanted to watch Game Plan. She brought it from her mom's house, promising fun, laughter, and ballerina hijinx. Before we popped in the DVD, she warned us that the "S" word was used a lot. Being more than a little concerned, I called The Ex and asked her about the movie. She said she didn't remember the "S" word at all. I decided that we would just turn the movie off should anything unsavory pop up. About 30 minutes into the movie, the "S" word popped up -- but not THE "S" word, just MY "S" word -- "stupid." Flower cringed when they said it, but we assured her it was okay. I just don't want the kids to use it as a mean thing to say to each other. She's a good girl to worry about it. When I was single (and bitter), I used to call February 14 "Singles Awareness Day." Clever, no? But, now that I am happily married, I can call it what it is: The Day for Lovers. Hope your Valentine's Day is wonderful and full of x's and o's. Today is a Snow Ice Day. The rain is still coming down and freezing to the inch of ice lining the ground. Mini-me is so disappointed because today was her Valentine part at school. We spent a painstaking 15 minutes writing her name on 12 cards last night. On one, she decided to write "something else," which looked like hieroglyphics. Now our little sweet Valentine girl is singing "You Can't Stop the Beat" from Hairspray, but using it more as a warning to those who would try. She has told GrandPatty, Papa Ken, Grandma, and Grandpa that they can't stop the beat and to shake it. I hope wherever you happen to be that you are warm and snug and that you don't slip on the ice. I have several errands to do today, so hopefully I won't slip, either. Last night as they were predicting a "slight chance" for snow on the 11:00 news, it was coming down hard. School was already cancelled today due to the Potomac Primary, but ballet was still a go. It's still coming down in large, puffy flakes. We could get 3 inches or so before it turns over to rain. By tomorrow night, all of the lovely snow will be gone and a muddy mess will be left in its place. But for now, we will enjoy the snow. Sometimes Mini-me picks up on things I wish she didn't. For example, on Friday on the way to school, she asked me several times if she could "get a what-what." (For those unfamiliar with the concept of the "what-what," it's a hip-hop song. Apparently, I sing hip-hop at home.) But, sometimes Mini-me picks up on things that I wish she would remember forever. Today at church, they talked about holy places in all of our meetings. Tonight during Family Home Evening, Curly asked what the holy places were. We were expecting Flower to answer, but instead Mini-me piped up with "Temples, churches, and our homes." I was so proud of her. She can totally have a "what-what." I suggested to Curly that we have Chipotle tonight in honor of Fat Tuesday. I hope he takes it for what it was -- a demand request thinly and passive aggressively veiled in a suggestion. Last night, we tackled the ants that have been plaguing our kitchen. We think we found the source -- a wet mess under the sink. Our spray wand has a little leak. We cleaned and sanitized and sprayed with pesticide. I saw one ant today and all I could think was the movie "I Am Legend." This morning, Gracie came in from her morning business outside and started her laps around the dining room. I noticed in the kitchen some little spots of blood and wondered if I had cut my foot. 'Twas not my foot that was cut, but Gracie's. She had ripped her toenail off, exposing the sensative vein underneath. It took some time to get the bleeding under control, and now it is wrapped in attractive gauze. Mini-me danced near her shortly after the incident, and Gracie looked away as if to say: "You mock my pain." On the way to ballet, Mini-me tripped and fell. She told everyone that she broke her hands and her leg. She danced her way into ballet, but halfway through the class, she just lost it and refused to tap tap tap her toes, opting instead to stand in front of the long mirror and cry. The teacher came out to get me, but unfortunately, I was in a class with Patch. When I came back, Mini-me ran out to me and announced: "I am having a tough time." Indeed. On the way home, she tripped again, even though she was trying to be careful. Now she is sitting in her underwear* watching TV. The only one who can save us from ourselves on this Super Fat Tuesday is Mitt. If he takes a few states from the liberal in conservative's clothing, all the pain and anguish will be worthwhile. *Because sitting in her underwear helps her feel better. I think I would agree with this. Marianne is impulsive, romantic, impatient, and perhaps a bit too brutally honest. She plays the pianoforte beautifully and has a captivating singing voice to boot. She feels deeply and loves pationately. ME TOO!!! What a lame way to end the season, Patriots. I mean, really. All the hype to lose by a lousy 4 points. Not to mention the trash talk we had to endure from little Giants-lovin' Flower. To top off the evening, Gracie snuck a taste of the chocolate cake earlier today (huge chunk missing), so by the time we ate it, it was a little dry. Next time I need to make the cake day-of and also bake it for about 10 minutes less. On a more positive note, I finished binding Grandpa's quilt and Patch said "Gracie." It even sounded like Gracie. He then proceeded to chase the poor chocolate-cake-stealing dog around calling "Gracie! Gracie! Gracie!" That wore him out a bit, so he asked to go "nigh-nigh." We let him. My favorite ads were the Coke ads. The Macy's Thanksgiving Parade balloons fighting over the Coke balloon was classic. The second ad featured James Carville and Bill Frist, both of whom I met as an intern on The Hill, working for the Senate Special Committee on the Year 2000 Technology Problem (in case you're wondering, I solved the problem. You're welcome). In the commercial, the rode around DC on a double decker bus, enjoying the sights of our nation's capital, and also enjoying a Coke or two. In this election season, the lesson of partisan tolerance did not go unnoticed. One of the best parts of entertainment in 2008 has been the Masterpiece Theater Jane Austen marathon. I have loved every installment. One of the most anticipated for me was Northanger Abby, a story about a girl with an overactive imagination from reading too many novels who gets involved with people who are only after money (which she has none). It was great. I love to stitch while watching these movies. I get a little thrill when the heroines are stitching in the movie. 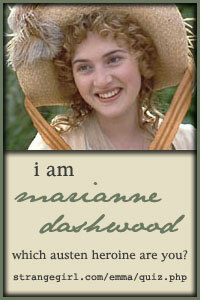 At the end of Mansfield Park, PBS showed a little promo asking which of Jane's leading men do you prefer? Such a great question. Do you like a man like Captain Wentworth, who, even years after knowing you, still is in love? Or how about Edmund, who is kind and sincere and values integrity. Or how about the infamous Mr. Darcy? He may be a little off-putting at first, but is utterly devoted in the end. What I love about Jane Austen is that every gets what they deserve in the end. The sweet girl makes the best match, while those who scheme and lie get he same back at them. I can't wait for the rest of the series. I am putting my new stadium cake pan to good use today. I made a Blueberry-Lemon Bundt Cake from Martha earlier today. That cake is going to the FtP cast party tomorrow. I have a Chocolate Sour Cream Bundt Cake ready to go in the oven. That one will stay here for our Super Festivities. Go Patriots!! 1. Preheat oven to 350 degrees. In a bowl, whisk 2 1/2 cups flour with baking powder and salt; set aside. 2. In a mixing bowl, cream butter and sugars on high speed until light and fluffy. Add eggs, one at a time, beating until incorporated. Beat in vanilla. Reduce speed to low; add flour mixture in three additions, alternating with two additions of sour cream. 3. In a bowl, toss blueberries and zest with remaining teaspoon flour; gently fold into batter. Coat a 12-cup nonstick Bundt pan with cooking spray. Spread batter in prepared pan. 4. Bake cake on bottom rack of oven until a toothpick inserted into center of cake comes out clean, 60 to 70 minutes. Cool in pan 20 minutes. Invert onto a rack; cool completely, top side up. Dust with confectioners’ sugar before serving, if desired. To melt the bittersweet chocolate for this Bundt® cake, chop it finely with a serrated knife. Then place the chocolate in the top pan of a double boiler and warm the chocolate, stirring occasionally, until smooth and creamy. Set aside to cool slightly. Have all the ingredients at room temperature. Position a rack in the center of an oven and preheat to 325°F. Grease and flour a decorative 10-cup Bundt® pan. To make the cake, over a sheet of waxed paper, sift together the flour, cocoa powder, baking powder, baking soda and salt; repeat until well blended. Set aside. In the bowl of an electric mixer fitted with the flat beater, beat the butter on medium speed until smooth and creamy, 30 to 45 seconds. Reduce the speed to low and gradually add the granulated sugar, beating until blended. Increase the speed to medium-high and continue beating, occasionally scraping down the sides of the bowl, until the mixture is light and fluffy, 3 to 5 minutes. Add the eggs a little at a time, beating each addition until incorporated before adding more, until the mixture is thick and creamy, 1 to 2 minutes; stop mixer occasionally and scrape down the sides of the bowl. Beat in the vanilla. Reduce the speed to low and fold in the flour mixture in three additions, alternating with the sour cream and beginning and ending with the flour, until just blended and no lumps of flour remain. Then gently fold in the chocolate. Pour the batter into the prepared pan, spreading the batter so the sides are about 1 inch higher than the center. Bake until a toothpick inserted into the center of the cake comes out clean, about 1 hour. Transfer to a wire rack and cool the cake upright in the pan for 10 minutes. Meanwhile, make the glaze: In a small saucepan over low heat, combine the granulated sugar and water and stir until the sugar is dissolved. Remove from the heat and stir in the chocolate liqueur. Set the rack over a sheet of waxed paper, invert the pan onto the rack and lift off the pan. Generously brush the warm cake with the glaze. Let the cake cool to room temperature, then dust with confectioners’ sugar just before serving. Top slices with a dollop of whipped cream. Serves 16.